UK: RWE Innogy has given its final investment decision for the revived 336MW Galloper offshore project, with three investors each taking a 25% in the project, 12 months after it was to be scrapped. Macquaire Capital, the Green Investment Bank (GIB) and Siemens Financial Services will partner RWE on the £1.5 billion (€2 billion) project off the UK's east coast. Each project partner will hold a 25% stake in the project. Siemens has also been awarded the turbine supply contract. It will deliver 56 6MW turbines to the site and service them for 15 years. RWE has arranged the project's debt financing, with 13 banks, including BNP Paribas and the European Investment Bank, providing £1.37 billion in facilities. 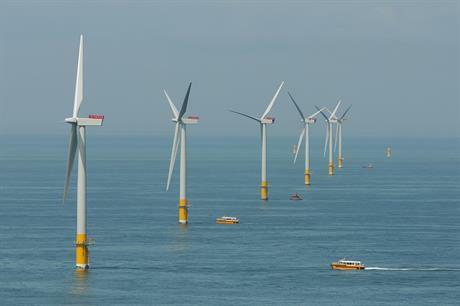 GIB said this is the first construction-ready offshore wind project finance deal in the UK. Construction is expected to begin in November at the site 27 kilometres off the Suffolk coast, close to the existing 504MW Greater Gabbard offshore project, also developed by RWE, in partnership with SSE. The project is expected to receive subsidy support under the current renewables obligation (RO) scheme, therefore it must be online by March 2018. "Achieving financial close quickly was an essential component for Galloper to remain on track in regards to construction, as well as becoming operational, in time to qualify from the government's renewable obligation certificate subsidies," said Wolfgang Bischoff, head of energy finance EMEA at Siemens Financial Services. In October 2014, RWE decided scrap the project after its original joint partner, SSE, announced plans to pull out of the development. RWE cited tight-time scales to secure the financing while still qualifying for the renewables obligation subsidy scheme, despite being in talks with the Green Investment Bank at the time. However in December 2014, RWE announced it was looking into reviving the project under the government's new contracts for difference (CfD) support scheme, which had been designed to replace the RO system after a short crossover period. In January 2015, RWE said it would submit a bid in the first round of the CfD auction, while also remaining eligible for RO support. RWE was unsuccessful in the auction. RWE decided to press ahead with arranging financial partners and applying for RO support. Conditions around the RO grace period for offshore projects mean the first turbine at the project must be generating power by March 2018. Galloper is the second UK offshore project this week to receive a final investment decision. Dong Energy gave the go-ahead for its 649MW Walney Extension development in the Irish Sea. Siemens won a deal to supply half the turbines to Dong.